Paris, 12th May 1803, partially printed document issued by the British Embassy in Paris, to J. Charles Clermont, in French. 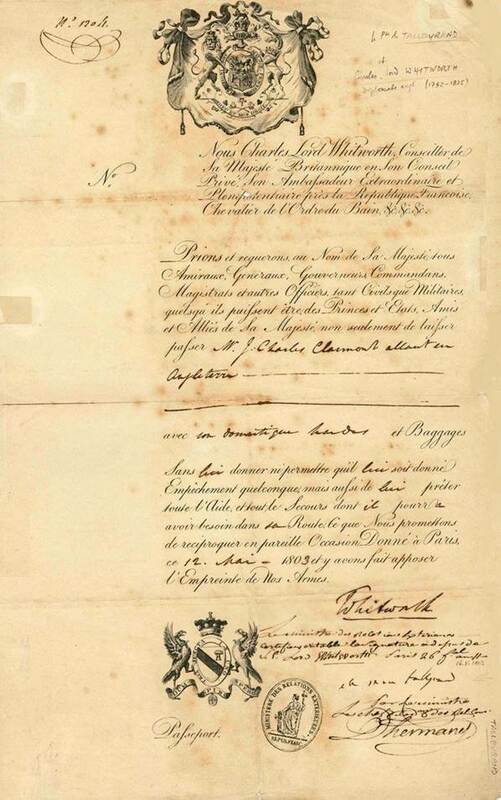 The attractive document, bearing two large printed coats of arms, is a passport authorizing Charles Clermont to return to England together with his servant, and states ‘Charles Lord Whitworth, Counselor of Her British Majesty and British Ambassador to France, asks and requests in the name of Her Majesty to all Officers and authorities, civil and military ones, Princes and friend States and allies of Her Majesty, not only to let Charles Clermont cross any territory, with his servant and luggage, but also to give him any help he may require on his way back to England. We promise reciprocity on similar situations…‘ Beneath the British Ambassador’s signature, and annotated in another hand ‘The Foreign Affairs Minister certify that the above signature of H.E. Lord Whitworth is authentic, Paris, 16th May 1803‘, signed by Talleyrand in his capacity as Foreign Affairs Minister. Also signed by a Diplomatic service officer, and bearing a contemporary ink stamp of the French Foreign Affairs Ministry. Charles Whitworth (1752-1825) British Ambassador to France. Whitworth demanded his passports on 12th May 1803, the same day the present passport was issued, and left Paris. Whitworth reached London on 20th May. Two days after Talleyrand signed the present document, on 18th May 1803, Britain declared war against France. On 22nd May Napoleon ordered the arrest of all British residents in France. On 13th March 1803 took place the famous scene between Napoleon I and the British Ambassador at the Tuileries. Before a full court Napoleon exclaimed loudly to Whitworth “Misfortune to those who do not respect treaties. They will be accountable to the whole of Europe”. Whitworth will later state “He was too agitated to prolong the conversation; I therefore made no answer, and he retired to his apartment repeating the last phrase. Two hundred people heard this conversation, and I am persuaded that there was not a single person who did not feel the extreme impropriety of his conduct and the total want of dignity as well as of decency on the occasion’. Charles Maurice de Talleyrand-Périgord, prince de Bénévent, then prince de Talleyrand, was a French bishop, politician and diplomat. Due to a lame leg, he was not able to pursue the military career that had originally been foreseen for him by his family. Instead he studied theology. In 1780, he became Agent-General of the Clergy and represented the Catholic Church to the French Crown. He worked at the highest levels of successive French governments, most commonly as foreign minister or in some other diplomatic capacity. His career spanned the regimes of Louis XVI, the years of the French Revolution, Napoleon, Louis XVIII, and Louis-Philippe. Those he served often distrusted Talleyrand but, like Napoleon, found him extremely useful. 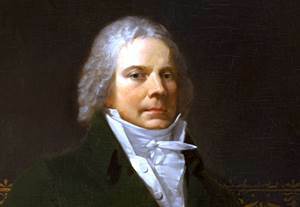 The name “Talleyrand” has become a byword for crafty, cynical diplomacy. He was Napoleon’s chief diplomat during the years when French military victories brought one European state after another under French hegemony. However, most of the time, Talleyrand worked for peace so as to consolidate France’s gains. He succeeded in obtaining peace with Austria through the 1801 Treaty of Luneville and with Britain in the 1802 Treaty of Amiens. He could not prevent the renewal of war in 1803 but by 1805, he opposed his emperor’s renewed wars against Austria, Prussia, and Russia. He resigned as foreign minister in August 1807, but retained the trust of Napoleon and connived to undermine the emperor’s plans through secret dealings with Tsar Alexander of Russia and the Austrian minister Metternich.